Our unique upholstery cleaning process will leave your upholstery perfectly clean, deodorised and residue-free. The upholstery cleaning process provides a deep clean and a quick drying time, whilst also revitalising your upholstery and prolonging the life-span. A combination of the deodorising and anti-bacterial agents present in the upholstery cleansing system leaves upholstery smelling fresh and free from bacteria. 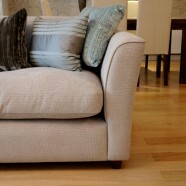 Compact Cleansing can also apply stain guard to your upholstery. The stain-guarding service provides a protective shield that helps to repel liquid, dirt and grime, giving you time to clean spills and prevent staining. Find out more about the stain guard for upholstery services. Interested in Upholstery Cleaning Services / Upholstery Cleaners?